CLIMATE change. It's been coined as the "biggest global health threat of the 21st century", causing hundreds of millions of people to feel the effects of wilder weather and rising heat over the last 20 years - and Queensland is smack bang in the middle of it right now. Hundreds of people have been evacuated from their homes, and thousands of hectares scorched, as the Deepwater fires burn their way into the history books. With unprecedented fires blazing north of Bundaberg and across the state, fireys are working overtime to combat the crisis. 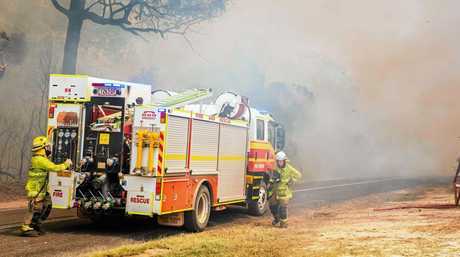 One New South Wales Rural fire service volunteer, Martin Williams, said the fight was one that would continue into the future. "I say to Queenslanders this is unprecedented, but sadly get used to it," said Mr Williams, who is part of the efforts to control the Deepwater blaze. IN ACTION: On the frontline of the Deepwater fire. "This may be something you haven't seen before, but you will see more of." It's a concerning sign of the times to come, says former Queensland Fire and Emergency Services Commissioner Lee Johnson. "I have never seen anything quite like this," Mr Johnson told the NewsMail yesterday. "I very strongly believe the conditions we are experiencing are nothing like the conditions when I first joined the fire service, over 40 years ago. "There have been bad fires in Queensland before - but to have such a concentrated and extreme event over such a large area, is just beyond people's imaginations." Mr Johnson was not optimistic about the long-term outlook. He warned residents they should prepare for harsher weather conditions in all seasons as an after-effect of climate change. "All Queenslanders have to be more conscious and aware that extreme weather events as a result of climate change are going to be an ongoing occurrence," he said. As higher-intensity weather and natural disasters occur, increasing stress on the shoulders of the state's emergency volunteers is inevitable. 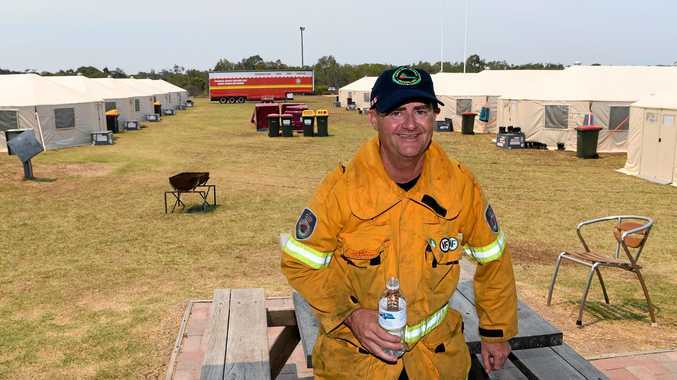 "The disaster management system relies heavily on the volunteer workforce, we have thousands of volunteers engaged in various fires ... the frequency and time pressures put on volunteers is ever increasing," he said. "The volunteers are the backbone of emergency response in the state, and as conditions like this continue there will be more pressure on them." It's not just the people who have lost their homes who are to suffer. Climate change is already affecting thousands of Queensland farmers and that trend won't slow down any time soon, Farmers for Climate Action CEO Verity Morgan-Schmidt says. "The agriculture industry is the backbone of many of the regions in Australia, and in reality when farmers suffer it doesn't just end there, the community suffers too." Ms Morgan-Schmidt said with wilder weather conditions expected, now was the time to act if there was any chance. "It is absolutely devastating ... These are unprecedented style conditions and the science tells us this is exacerbated conditions driven by climate change," Ms Morgan-Schmidt said. "Farmers are on the front line of climate change impacts, whether that be through rising sea levels, drought or extreme fire conditions and heat waves like the ones playing out in Queensland right now." She said when the farmers struggled, everyone in the wider community struggled, and nobody was immune to climate change. "The toll it takes on mental and physical health, as well as the resilience of their businesses ... in the horticulture sector, plant production will shift and the same impacts will be felt by the agriculture sector," she said. "The reality is, if we allow climate change to continue on the trajectory it is now, we will find incredibly severe impacts on the agriculture industry." A crackdown on emissions and increase in funding and development for renewable energy sources is the only way forward, Ms Morgan-Schmidt stressed. Mining giant Adani recently committed to begin its construction of the controversial Carmichael mine in central Queensland, just before the holiday season. It would mean thermal coal would be exported out of the country before the end of 2020. "We know we have the solutions available to us, and as a nation we have so much to lose by failing to act, and so much to gain by stepping forward and doing our bit," she said. "Our emissions are trending in the wrong direction, with a 0.6 per cent increase across the board. We need to take stock. We are saying we have farmers backs, but we don't when we are backing new thermal coal mines and watch those emissions increase." Macadamias, are a staple tree crop in Bundaberg's agricultural industry, but the plant is known to be susceptible to heatwave conditions. "Its too early to know the extent the farmers will suffer, but heatwaves do damage productivity on farms," she said. "Managing conditions are what farmers do best, but you can't manage runaway climate change." Mr Johnson said while some were busy arguing the cause of climate change - it shouldn't mean the science should be discounted altogether.